A hammertoe is a deformity that can occur from a number of causes. It is so called, because the toe(s) resemble a hammer. They are permanently bent at the joints, rather than lying normally. While this deformity can occur on any toe, it is most common on the second, third or fourth toe and affects the joint closest to the end of the toe. 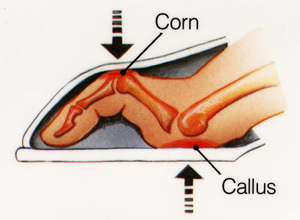 A similar condition is mallet toe, which affects the upper joint, closest to the foot. If the joints of the pinky or big toe are affected, it is a different condition. Other than the deformity, there may be pain, chafing, blistering, corns, calluses or other forms of irritation caused by one toe leaning against the other or by the way the joints press against footwear. If the condition is allowed to worsen, walking can become painful and difficult. What are the Causes of Hammertoes? A muscle imbalance from an unnatural walk, painful conditions affecting the bottom of the foot, such as corns, plantar warts or calluses, poorly fitting shoes, flat feet and high arches are among the most common causes. In addition, the deformities may accompany arthritis, stroke, Charcot-Marie-Tooth disease and diabetes. There are many suggestions for successfully treating hammertoes. Buying new shoes with soft, spacious toe boxes is the first order of business. Avoid high heels and other styles with unnatural narrow, pointed toes. It is possible to be stylish without cramping your feet. Shoes by Aetrex, Beacon and Arcopedico are stylish and dressy, yet comfortable and foot-friendly. Treating problems, such as corns and calluses, is the next order of business. If the toes are curling in order to take pressure off of a painful area on the bottom of the foot, addressing that issue will allow the toes to gradually straighten. Gel comfort insoles, corn pads, callus removers or a trip to the podiatrist to treat a wart could be beneficial. If the problem is caused by a problem with the arch that puts too much pressure on the joints of the toes, arch supports may be beneficial. Shoe inserts, as well as custom orthotics are available from Foot Smart. Once the cause of the issue is addressed, toe trainers and straighteners can be used at home to realign the joint, before the deformity becomes severe. Hammertoe straighteners from Foot smart are affordable, help to correct the problem and provide pain relief, in the meantime. Toe exercises can be done at home, too, to stretch and strengthen the muscles. One simple exercise is to use the toes to pick up small objects off of the floor. If the muscles are not quite that strong, lay a towel flat on the floor and use your toes to crumple it. The muscles will get stronger as time goes by and that will help to straighten out the joint. If physical therapy or at-home straighteners are ineffective, orthopedic surgery may be necessary to correct hammertoes. But, that’s a last resort. Thanks for the post!The post is very much informative.Flex Protex is a good way to relieve joint pain. Arthritic patients feel a lot of pain in the joints which can be alleviated by taking Flex Protex. Being made of glucosamine, the main component responsible for relieving joint pain, this product is here to stay.